Overlooking the Gulf of Oman, Villa Muscat combines the experience of an endless landscape with the sense of living in a garden. 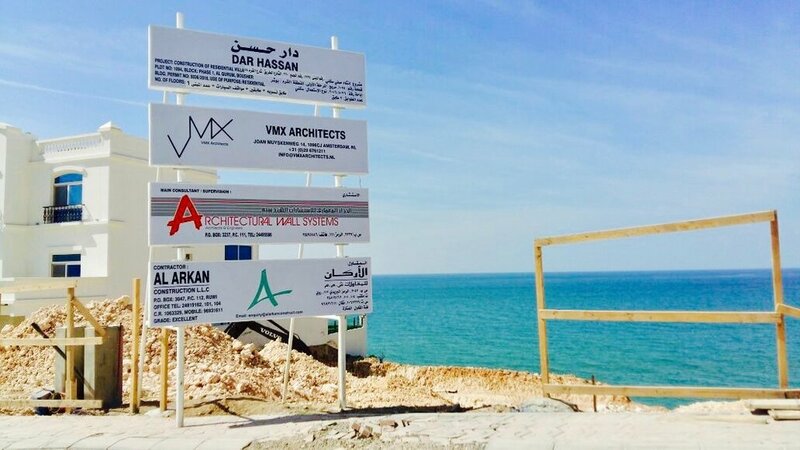 The villa’s exceptional location has been taken as a starting point to develop a new housing type amidst the traditional coastal residences. Firmly grounded in the rocky coastline, the house’s lower floor gives space to sleeping quarters and guestrooms, as well as more secluded living spaces. The upper floor, in contrast, is oriented towards the exterior. The open floor plan, playfully arranged by means of green patios and more closed service spaces, provides magnificent views over the water, from between the lush greenery. In response to Muscat’s warm and humid summers, an optimal climate is sought by the use of water elements and interior gardens that can be comfortably enjoyed while sheltered from the heat.